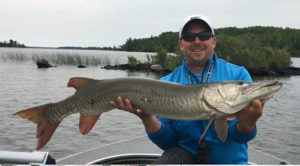 Predominantly east winds and cooler-than-normal water temperatures made for an uncertain musky “bite” during the University of Esox Canada Musky Adventure on Lake of the Woods in July, but students and staff worked together to compile yet another great catch. When it was over, 132 muskies had been boated during the week-long event, which was held July 15-22 at Sandy’s Blackhawk Island camp on LOTW’s Northwest Angle. Bruce Ross with his 53-incher. At least 85 (64.4 percent) of the muskes caught were triggered either in the figure-8, or with a “deadstick” maneuver with minnowbaits and jerkbaits. “The important thing was our students bought into the idea of a figure-8 on every cast, and everybody ended up catching muskies. Being good at boatside is always important when musky fishing, but really mattered during the school,” Heiting continued. 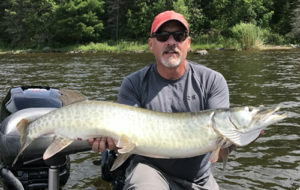 Bruce Ross of Mequon, Wisconsin, caught the largest musky of the event, a 53-incher on a twin-ten bucktail while being guided by resort owner Bill Sandy. It was Ross’ personal best musky. By catching nine muskies during the week, Ross also won the school’s Top ’Lunge Award, which goes to the student with the most fish. Also catching nine muskies during the week was Bill Nichols of Vancouver, Washington, but the total inches of his fish were slightly less than that of Ross. Nichols’ top fish measured 47 inches and was caught on a Mepps Musky Flashabou. Jordan Guck of Duluth, Minnesota, enjoyed a great week by catching 50- and 49 1/2-inch muskies on a ShallowRaider and a Double Cowgirl, respectively. Jordan Guck with his 50-incher. “Normally twin-tens account for almost all of our muskies, but this year it was smaller spinners, like the Junior Cowgirl and Musky Flashabou, that stood out, as well as minnowbaits,” Heiting said. Also catching muskies measuring at least 45 inches were: Ed O’Neill of Dwight, Illinois, 49 1/2 inches (tied for his personal best) on a Double Cowgirl, and 48 inches on a bucktail; instructor Kevin Schmidt, 48, 47 and 46 inches, all on a Slammer minnowbait; 47 3/4 inches by Mike Aalberg of Lincoln, Nebraska, on a Junior Cowgirl; Rob Kivela of Marquette, Michigan, 47 1/2 inches on a Double Cowgirl; 47 inches by Jack Horvath of Glenview, Illinois, on a bucktail; 47 inches by Matt Doyle of Atlanta, Georgia, on a bucktail; 47 inches by Brandon Sandy on a bucktail; 46 and 45 inches by T.J. Henriksen of Pittsboro, Indiana, on bucktails; 45 1/2 inches by Marty Forman of Mequon, Wisconsin, on a Crane Bait; 45 1/2 inches by Pam Ross on a bucktail (personal best); 45 1/2 inches by Heiting on a Mepps H210; and 45 inches by Jeci Hurkman of Marquette, Michigan, on a Shallow Invader. Another large musky was caught by Jack Horvath on a figure-8 on the school’s final day. However, as he lifted the fish from the net to measure and photograph it, the musky — which Jack and his father, Kurt, agreed was considerably larger than the 47-incher Jack caught earlier in the week — thrashed and fell back in the water and was gone. “Because they didn’t know its length or get a photo, they chose not to list the fish on our charts. The fact is, Jack caught it and he and his dad have a great memory,” Heiting noted. The 2018 Canada Musky Adventure will be held July 14-21, again at Sandy’s Blackhawk Island. Watch Musky Hunter for details.